Reading and share top 9 famous quotes and sayings about Answering The Call by famous authors and people. Browse top 9 famous quotes and sayings about Answering The Call by most favorite authors. 1. "A hero is also someone who, in their day to day interactions with the world, despite all the pain, uncertainty and doubt that can plague us, is resiliently and unashamedly themselves. If you can wake up every day and be emotionally open and honest regardless of what you get back from the world then you can be the hero of your own story. Each and every person who can say that despite life's various buffetings that they are proud to be the person they are is a hero. Now I do have to mention the real heroes of The Trevor Project, the men and women volunteers, all of whom stand up day after day answering the calls of desperate teens whose circumstances have pushed them to the edge of the abyss. To take that call, and say yes, I will be the one who saves this life takes such courage and compassion. Hemingway's definition of ‘grace under pressure' seems fitting as the job they do is every bit as important, and every bit as delicate as a soldier defusing a bomb." 2. "The only power that can effect transformations of the order (of Jesus) is love. It remained for the 20th century to discover that locked within the atom is the energy of the sun itself. For this energy to be released, the atom must be bombarded from without. So too, locked in every human being is a store of love that partakes of the divine- the imago dei, image of god…And it too can be activated only through bombardment, in its case, love's bombardment. The process begins in infancy, where a mother's initially unilateral loving smile awakens love in her baby and as coordination develops, elicits its answering smile… A loving human being is not produced by exhortations, rules and threats. Love can only take root in children when it comes to them- initially and most importantly from nurturing parents. Ontogenetically speaking, love is an answering phenomenon. It is literally a response." 3. "For suddenly above him far and faint his song was taken up, and a voice answering called to him. Maedhros it was that sang amid his torment. But Fingon climbed to the foot of the precipice where his kinsman hung; and then he could go no farther, and he wept when he saw the cruel device of Morgoth. Maedhros therefore, being in anguish without hope, begged Fingon to shoot him with his bow; and Fingon strung an arrow, and bent his bow. And seeing no better hope he cried to Manwe, saying: 'O King to whom birds are dear, speed now this feathered shaft, and recall some pity for the Noldor in their need! '....Now, even as Fingon bent his bow, there flew down from the high airs Thorondor, King of Eagles, mightiest of all birds that have ever been, whose outstretched wings spanned thirty fathoms; and staying Fingon's hand he took him up, and bore him to the face of the rock where Maethros hung." 4. "Everett Walsh!" Chloe exclaimed. I fell off the bed laughing.Liz folded her arms and tried to scowl at us, but I could tell she was having a hard time keeping a straight face. "What's wrong with Everett Walsh?" she sputtered. "I didn't know when she wrote this in seventh grade that Hayden would hook up with him later.I saw him first. ""He's so straitlaced," Chloe said. "Not exactly the ideal hero of a romance. ""Watch out for his mama," I advised Liz. 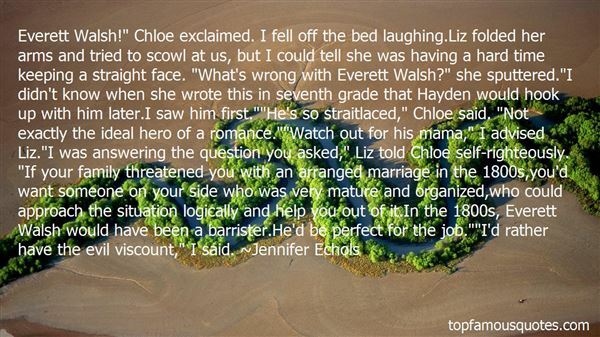 "I was answering the question you asked," Liz told Chloe self-righteously. "If your family threatened you with an arranged marriage in the 1800s,you'd want someone on your side who was very mature and organized,who could approach the situation logically and help you out of it.In the 1800s, Everett Walsh would have been a barrister.He'd be perfect for the job. ""I'd rather have the evil viscount," I said." 5. "Just so you know Labrodor retrivers do not howl.Begals Howl.Wolves howl. Labs do not howl, at lestnot well. Marley attempted twice to howl, both times in answer to a passing police siren, tossing back his head, forming his mouth into an O shape, and letting loose the most pathetic sound Ihave ever heard, more like gargling than answering the call of the wild. Butnow,no question about it he was howling." 6. "Dr. Dunbar would never consider not answering the call of duty." 7. 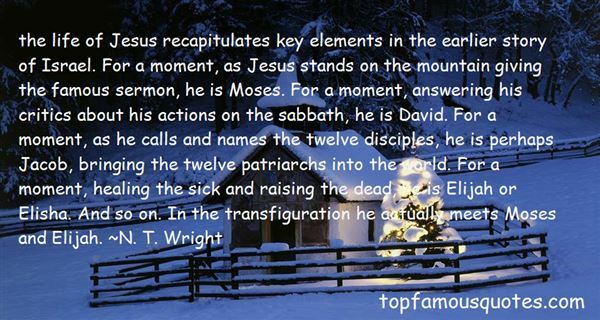 "The life of Jesus recapitulates key elements in the earlier story of Israel. For a moment, as Jesus stands on the mountain giving the famous sermon, he is Moses. For a moment, answering his critics about his actions on the sabbath, he is David. For a moment, as he calls and names the twelve disciples, he is perhaps Jacob, bringing the twelve patriarchs into the world. For a moment, healing the sick and raising the dead, he is Elijah or Elisha. And so on. In the transfiguration he actually meets Moses and Elijah." 8. "The old, endless, approachable and always answering Sorrow," says my father Lucifer. "For who calls on me never goes unanswered. Only prayers to God go without answers." 9. "WHY ARE YOU NOT ANSWERING YOUR PHONE?!? OH MY GOD, DID YOU SEE THE ARTICLE? I AM FREAKING OUT, WHY ARE YOU NOT ANSWERING YOUR PHONE?!? Please call me, I'm starting to act like Tizzy around here. It's getting ugly. Oh, hi, Mr. and Mrs. Cuttler, in case you get this first. 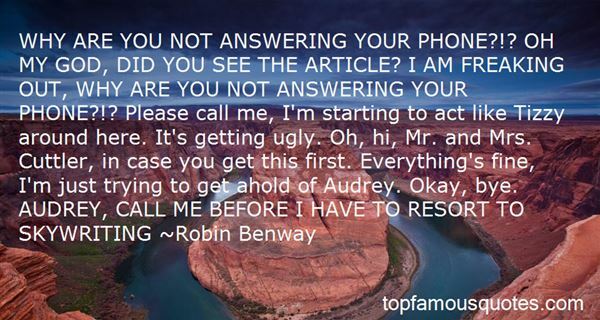 Everything's fine, I'm just trying to get ahold of Audrey. Okay, bye. AUDREY, CALL ME BEFORE I HAVE TO RESORT TO SKYWRITING"
I had the same worry that we wouldn't later be able to undo whatever it was we were doing to ourselves."